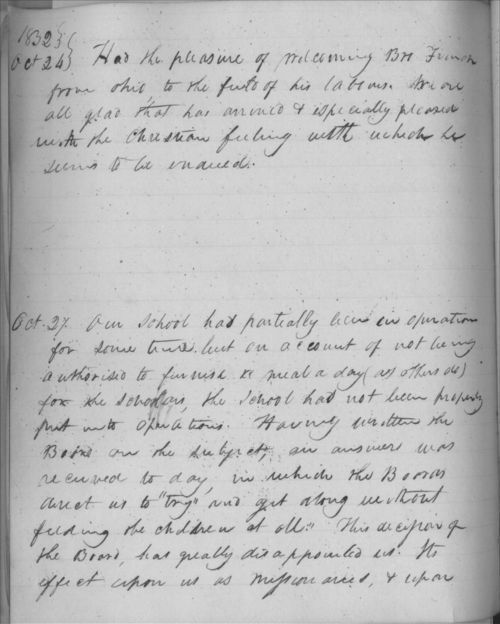 According to this journal entry, Johnston Lykins and his fellow missionaries at the Shawnee Mission in Indian Territory (now northeast Kansas) had written to the school board requesting permission to provide meals for the students. Their request was denied, and the missionaries feared that their students would no longer attend classes. Since it has to do with school lunches, 7th graders studying this standard will relate to this entry. It also demonstrates how some missionaries were trying to provide for their students' well being.